Émilie Du Châtelet worked on various scientific topics during the late 1730s, and the Essai sur l’Optique, or “essay on optics,” comes from that period. It shares much in common with her essay on the nature and propagation of fire, and serves as an important counterpoint to some aspects of her major later work, the Foundations of Physics. 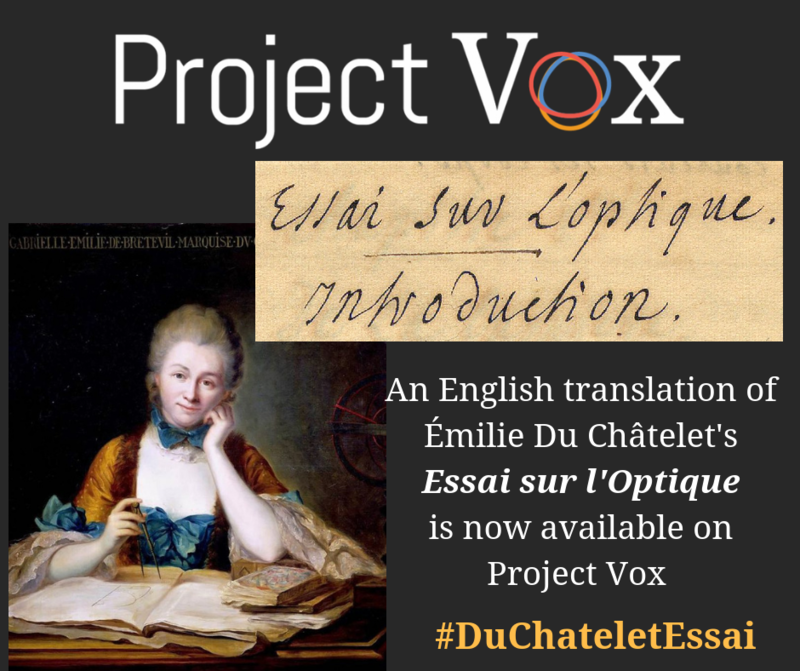 Scholars have known about Du Châtelet’s Essai sur l’Optique for many years. Until recently the text has been unavailable because all copies were thought to be lost. In 1947 Ira O. Wade published the first known edition of the Essai’s fourth chapter, which was held among Voltaire’s papers in Russia. Sixty years later, Fritz Nagel, Director of the Basel Research Center of the Bernoulli Edition, discovered the first complete copy of the Essai in the Bernoulli archives in Basel. Two other complete copies, which had previously gone unnoticed, were then discovered among Du Châtelet’s surviving manuscript material. Her work on optics opens a new window onto Du Châtelet’s natural philosophy as a whole. The text follows Isaac Newton’s approach and mimics many of his principles and experiments. She turns away from this approach later in her career, however, and so the Essai forms a turning point for her thought about the natural world. Much work remains to be done on Du Châtelet’s view of light. This online version does not account for the many intricacies and complexities of all the manuscript sources. A forthcoming edition will do just this, using all manuscripts to present a complete version of the Essai, together with Du Châtelet’s revisions and emendations.